SabrEx® for CORN brings the benefits of ABM’s® iGET™ Technology package to your corn crop. Yield data over the last four years has averaged more than an 8 bu/a yield increase. That’s a 5:1 return on investment. Now available: A formulation just for in-furrow application. The Trichoderma found in SabrEx® for Corn stimulates root growth, competes with root pathogens, enhances nutrient utilization, and increases stress tolerances. In the summer of 2012 SabrEx® for Corn was put to the test during drought conditions and performed remarkably. 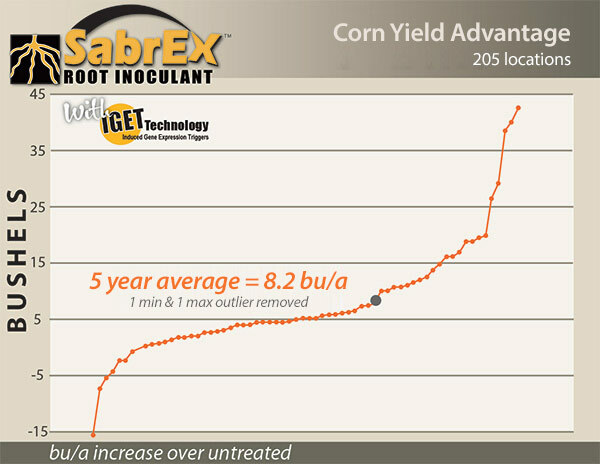 The number one advantage of treating seeds with SabrEx® for Corn is the yield increase. Over the past 4 years ABM® has been conducting field tests on over 380 plots, resulting in an average yield increase of more than 8 bu/a. SabrEx® for Corn brings the benefits of ABM’s® iGET™ Technology package to your corn crop. 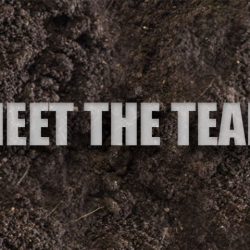 Tested across the U.S. Midwest under a wide variety of field and fertility conditions, SabrEx® for Corn has been shown to create more robust root systems, induce resistance to plant stresses like dry weather, and increase water and nutrient efficiency. Yield data over the last four years has averaged more than an 8 bu/a yield increase. That’s a 5:1 return on investment. 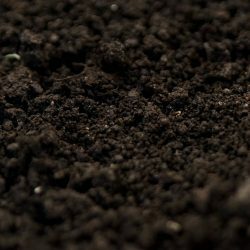 SabrEx® for Corn is a unique formulation of two (2) carefully selected, specific, patented proprietary biological fungi strains called Trichoderma. Trichoderma colonizes with the plants root system and develops a symbiotic relationship with the plant. The Trichoderma feed from the starches and sugars produced by the plant; while exuding beneficial enzymes and proteins for the host plants use. As a result the plant produces a larger root system improving its nitrogen and water use efficiency, thus resulting in higher yields. The Trichoderma found in SabrEx® for Corn stimulates root growth, enhances nutrient utilization, and increases stress tolerances. In the summer of 2012 SabrEx® for Corn was put to the test during drought conditions and performed remarkably. The biologicals found in SabrEx® for Corn colonizes the crop root system, induces altered gene expression through association with the host plant, and affects changes in plant physiology. This root colonization can affect the physiology of the whole plant, including the root system and even foliar/leaf biology. SabrEx® for Corn LQ is a liquid high concentrate formulation for commercial treaters only. It has a low application rate of 0.16 fl/oz./80k unit of seed. One 32 oz. jug will treat 200 units of corn. Once on the seed, SabrEx® for Corn LQ will not expire for two planting seasons. Applying SabrEx® for Corn LQ to the seed is a convenience to the grower. Refer to the SabrEx® for Corn LQ label for specific rates and directions for use. SabrEx® for Corn PB is a planter box treatment that can be added just before planting at the planter box. It consists of a talc/graphite formulation as the carrier for the Trichoderma. You will add .5 oz. 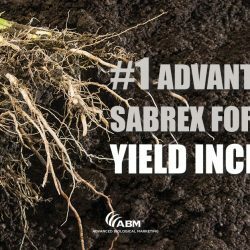 of SabrEx® for Corn PB for every 80K kernel unit of seed you add to your planter. Make sure to mix the SabrEx® for Corn PB into the seed corn thoroughly. It should be noted; The talc/graphite formulation also helps to lubricate your planter equipment and also helps provide seed flowability. SabrEx® for Corn PB will not replace your talc or graphite that you’ve been using, however it will complement your treatment. Refer to the SabrEx® for Corn PB label for specific rates and directions for use. SabrEx® for Corn In-Furrow is a liquid product for on farm use at planting. It has an application rate of 1 fl/oz. per acre. Refer to the SabrEx® for Corn In-Furrow label for specific rates and directions for use.